Travel with Kevin and Ruth! : What's the earliest thing in your life that you vividly remember? The earliest recollection of my life dates back to 1966. When I was four years old, my father took me on a cross Canada train trip from Ottawa out to British Columbia. Just me and my Dad! Of course it's fitting that the earliest thing I remember was a trip! I vividly remember being in one of those sleeper cars with the bunk beds and curtains. And we had stopped at a station along the way and it was in the middle of the night. I wanted to get off the train, but dad kept saying no, we'll only be here a short time. And yet obviously there was some kind of problem becuase we were there for hours. I probably asked four or five times, and yet we never got off the train. 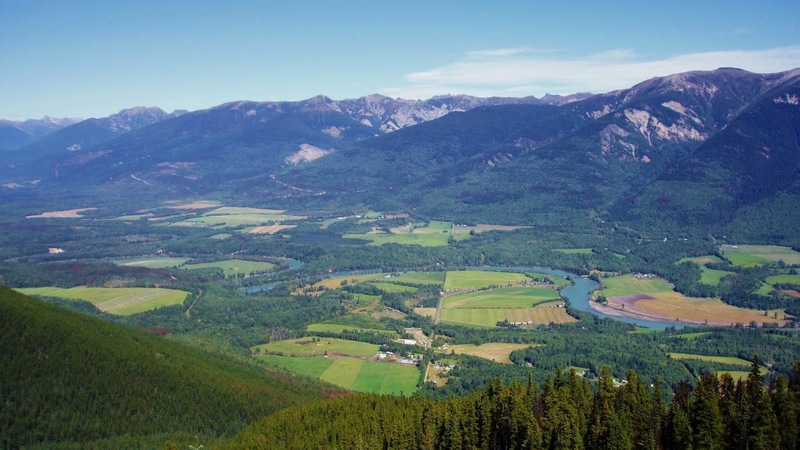 I also remember when we arrived at my grandparents farm in the beautiful Fraser River Valley at Dunster, British Columbia. Ruth and I revisted the area together in September of 2006. My grandparents farm was down there somewhere! My grandfather had a few cattle, and one of the cows had died while giving birth. I remember being in the barn and there was another cow there. He had built some kind of brace to hold the cow while the orphan calf tried to milk from it. The cow was not happy and was bucking like crazy trying not to let the calf take it's milk. I remember that like it was yesterday. And yet, I have no recollection at all of the trip back home. Memory is a strange thing. What's the earliest thing that you remember? I can clearly remember travelling from Rotterdam to Halifax on the ship "Rijndam", of the Holland America line in 1961. I was six years old. Twelve solid days of fog, with the foghorns blowing every few minutes. It was not fun. Yep, that doesn't sound too exciting for a 6 year old! It might have started off feeling exciting but by the 12th day I am sure it got pretty old. Funny... Grandma and I were just talking about you and your dad going out west when you were four and then again 14 when you drove and Grandma, Elaine and Alison took the train. I remember our trips to Red Pine Camp and our trip to the states to visit friends you had met down south. I remember I hated how she cooked squash and I didnt eat it again until I was about 25! I remember first day of kindergarten at 5 years old and was terrified. This was in downtown Toronto 1954, long time ago. So many more good memories after that. My near drowning at Lake of the Ozarks when I was five years old. My brothers were in a boat chasing a water moccasin. I was on the dock as they returned. I fell in the water and the waves pushed me under the dock. My mother got down on her stomach and reached underneath feeling around. I still remember (or think I do) her pulling my hair and grabbing me. After that I was afraid of water until they put me in swimming lessons. Oh no, what a terrible first memory to have! Glad they put you in swimming lessons after that. I was in hospital (had back surgery) and walking down the hall leaning on hallway walls to help support the heavy cast. I started school at the end of hospital hallway in a room with other children. Today I have full range of motion and no back problems - knock on wood (tapping head). So glad that your back surgery was such a success and that you haven't had any problems with it since. I remember getting a cast cut off my arm when I was three. My older brothers had convinced me I could fly, so I jumped off the top of the jungle gym, resulting in a broken arm. I don't remember the flight, but I definitely remember the doctor cutting off the cast. Sometimes big brothers aren't always so nice to their little sisters. I hope they felt bad for making you think you could fly. I think being a 3 year old and seeing a doctor coming at you with a saw would have been a little scary. The earliest memory I have is being in my Grandpa's old car that had the floor boards in the back seat rotted out. We all thought it was really cool that you could see the road when we were driving! My Grandpa died when I was 4, so that is really a long time ago!!! Lucky for me, and our family, he wrote a daily diary from 1929 until he went into the hospital (1970) a few days before he died. I have read that diary from front to back, in order. It was very interesting to read about history; both our family's and our world's, through his eyes. I really got to know my Grandpa through this diary. Feels like he was alive, reading it to me.... sounds kind of strange, but that is what it felt like. My Mom is now reading it. She talks to me a lot about things she never would have known if she would not have read his diary or if he would not have wrote it. It really is a family treasure!!! We had a car like that too, however I was older so I can remember it vividly, it was an old Plymouth push button car. I can always remember my mother telling the grocery boy not to put the groceries on the floor in the back seat because other than the carpet there really was no floor, lol! How wonderful that your Grandfather wrote a diary for all those years and that you took the time to read it. I wish I had a relative that would have done that. One of Kevin's Grandmother's did something similar and since then he had an uncle that wrote a book about what life was like growing up with Kevin's Dad and his other brothers and sister along with some of the family history. We have both read it too and found it very interesting as well and learnt some interesting facts too that we didn't know about before. Things like your Dad's diary and Kevin's uncle's book are truly family treasures.